NEW YORK CITY—Temperatures climbed into the upper 40s yesterday and brought players out in force to two notable outdoor chess spots in the Big Apple. Your humble blogger was there to witness the action. It’s a great day for Chicago. 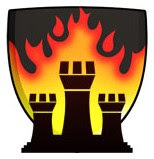 IM Greg Shahade, commissioner of the United States Chess League (USCL), has announced today on the league’s Web site that the Chicago Blaze will be one of two new expansion teams to join the league next season. Big league chess has come to Chicago at last. The USCL is a organization of competitive professional chess teams from across the country that play matches during a ten-week season that runs from late August to late October and is then followed by playoffs and a championship. The league currently has twelve teams from New York and Boston to Seattle and San Francisco but until now no team from Chicago. It’s the equivalent of Major League Baseball for chess, a fact that the league’s logo makes no attempt to disguise. The difference, of course, is that USCL players aren’t pampered and over-paid celebrities; they’re just strong chess players who represent their cities for a little bit of money and a lot of civic pride. Their accessibility will make the Blaze a great opportunity to promote chess generally in Chicago. The team roster includes GM Dmitry Gurevich, IM Angelo Young, FM Mehmed Pasalic, and young experts Adam Strunk and Ilan Meerovich. Glenn Panner, chess expert, tournament director, and organizer extraordinaire will be the team’s manager. The Blaze will play their matches on the Internet Chess Club from Angelo’s Touch Move Chess Center. The Blaze is an initiative of the Illinois Chess Association, and thanks must go to ICA President Chris Merli for supporting the project, to ace blogger and chess dad Brad Rosen for proposing the arrangement, and to über-organizer Sevan Muradian for recruiting players and spearheading the discussions with the USCL that led to today’s announcement. There would be no Blaze without Sevan. Nor without Evanston chess mom and ICA activist Maret Thorpe, who came up with the team name, and chess mom Andi Rosen, whose ideas and outreach to players at crucial stages were, well . . . crucial. I’m also proud and honored to be a part of the Blaze supporting cast (no, not as a player, heaven forbid), and I’m looking forward to working with all of these fine people to bring big-league chess to Chicago. There’s more on Glenn’s blog, and Brad’s site will probably have something on it soon. There will be more in the weeks to come. Stay tuned. It’s been around for barely a year, but in that time IM Angelo Young’s Touch Move Chess Center on North Ashland has become the gathering point for Chicago’s top chess players. Now the top junior players will gather there as well, when the center holds its first scholastic chess championship on Saturday, January 5. The tournament is open to all scholastic players (K-8) with ratings of 500 or better. The entry fee is $30, and it’s limited to 28 players. There will be five trophies awarded, along with chess clocks and chess books for the winners. It appears that this will be a monthly event, leading up to a finale at the end of the year. It looks like a lot of fun, so I’d urge qualified players to come and play. You can mail in a check or sign up online. Details here. 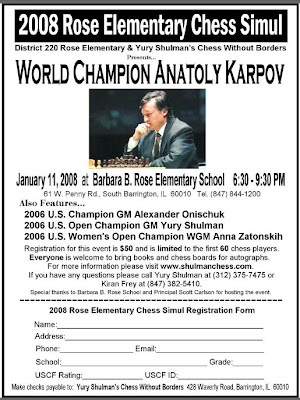 The very first post on this blog was about several Ray School kids who became Chicago Public School Chess All Stars by playing at the Mayor’s 2006 Holiday Sports Festival, held last year between Christmas and New Year’s. Well, here we are a year and 135 blog posts later, and whatayaknow it’s time for that blessed event again. This year’s festival will again be held at McCormick Place, next weekend, December 28-30, from 10 AM to 4 PM. If you’re one of those people who’s interested in things besides chess, you’ll find plenty to do. I couldn’t make it last year, and alas will have to miss it again this year, but I’ve heard it’s a lot of fun for both kids and adults, so if you’re looking for something fun to do next weekend, I encourage you to check it out. It’s free. Details on the festival here; details on the chess tournament here. Call Renaissance Knights, organizers of the chess events, if you have any questions. 55%How Addicted to Blogging Are You? Not bad, compared to some people, inluding one to who I owe a tip of the hat for directing me to this survey. Oy. P.S. While you're at Boylston, check out their latest caption challenge. Where does he find these things? It isn’t every day that an American chess player wins a major international title, but today is one of those days. Brooklyn-based Grandmaster Gata Kamsky, possibly the strongest player in the U.S., has just won the World Cup, beating GM Alex Shirov in the final round, in the Siberian town of Khanty-Mansiysk. 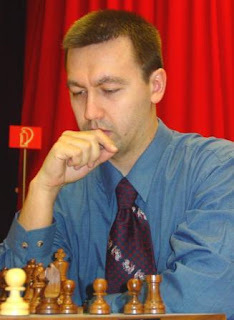 Kamsky defected to the U.S. from the Soviet Union in 1989. A few years later he dropped out of chess entirely to go to school, eventually completing a law degree. He returned to chess a few years ago, and many observers say he has returned to top playing form. His World Cup victory over a field with some of the top grandmasters in the world would seem to confirm that. I don’t know much else about Kamsky, other than the fact that he and GM Nigel Short sometimes still quarrel over the events at a match they played in the ‘nineties in which Kamsky’s father apparently harassed Short. More on the World Cup from Jennifer Shahade at the USCF site and at Chessbase. Kamsky’s bio here. It's not entirely clear to me who's playing whom, but you can see a bigger copy of the flyer here, and there's more information at Yury's Web site. Notice that there are a number of requirements they say you have to meet, and those requirements are cast in fairly inflexible language: failure to meet them “could” result in your kids being banned from the city championship. Whether or not they will enforce this, I don’t know; they have generally not done so in the past, at least not consistently, though I understand Whitney Young High School was prevented from playing in a major event last year for lack of one document. December 14 is the deadline for submitting your roster and Work Verification Form (details here). The roster goes to your Area Sports Manager (I think) and the Work Verification Form is filled out online, though you may be expected to submit a hard copy to the Area Manager as well. I’m not sure about that. Check with your Area Manager, and if you don’t know who that is call CPS Sports Administration at 773-553-3770. There will be a mandatory “coaches clinic” at some point, the date and location of which are “to be announced.” Since these announcements are generally not well communicated many coaches will probably not hear about this one. I would urge anyone who hears about it to spread the word far and wide. Let’s share information as much as possible. You can post any information you get in the comments section of this post or on the online forum of the Illinois Chess Association. The date of the city championship itself, which some of us were given to understand was scheduled firmly for March 8, 2008, is now “to be announced,” so I don’t know what’s up with that. One clarification: The copy of the document I received was a third- or fourth-generation photocopy that I scanned and cleaned up a bit to produce the one I’ve posted here online. It may not look exactly like the original CPS piece, though the text should be the same. Kids, take note: Just because you make mistakes, it doesn’t mean you lose. I made plenty of blunders and weak moves in this online blitz game (like not playing 11. Bxb7 - ? ), but my opponent made more of them. Comments on the game welcome, though please don’t be too unkind. This thing (I don't know what else to call it) is supposed to improve your board vision. That is, if it doesn't make you dizzy first. If you have the patience, imagine a chess piece in the (moving) central white square. Red=rook movements; blue=bishops; yellow=knights. I think. The item shown here was created by a guy named Tom Brown, and you can go here for more. Yes, it's a gimmick, and I'm using it to grab your attention. Give me a break; I have to do something to compete with BCC. Hat tip: Streatham & Brixton—who else? The tournament room at the Hyde Park Neighborhood Club was jammed yesterday, as about 85 kids from all over town came to play in the second chess tournament of the year by Chess Education Partners. That’s up from 48 players a month earlier and about half that at the first CEP tournament in the neighborhood last June. It looks like the world has discovered this excellent series of chess meets and is beating a path to Hyde Park. The funny thing is, not many Ray School kids are coming. Allen Dai, Phillip Parker-Turner, and Andy Margulis were the sole Castle Kimbark standard bearers this time. Allen finished second in a field of 13 in the Grades 2-3 division, and Phillip took third place out of 24 players in Grades 4-5. I assume they both got trophies, though, alas, I couldn’t be there for the ceremony at the end. For the same reason I don’t know which schools won the various team competitions. Sorry. The offical crosstable is here.